In an attempt to step up anti-terror cooperation, members of the grouping agree to hold regular consultations and set up a temporary working group to assess the security situation. Senior security officials from the BRICS countries met in Cape Town, South Africa to discuss four key ways of addressing the present-day challenges. International information security is a subject of heated debates among experts, top officials and in the mass media. Participants in the meeting decided to set up a working group that will be tasked to prepare a statement to be adopted by BRICS leaders at their next summit. “After that, they will begin to work on a relevant agreement,” Patrushev said. Concerning the problems of terrorism, extremism and radicalism, Patrushev said that the “threat is stable.” It was decided that a working groups would work on a temporary basis and would be transformed into a standing expert body when it proved its efficiency. In 2012, terrorist acts in transport were reported from 70 countries, including Russia. “It proves the necessity to invigorate efforts in this area, including the fight against sea piracy. Both those who commit such acts of terror and their organizers who finance such crimes must be called to answer,” Patrushev noted. Another key topic discussed at the meeting was the situation in hotbeds of tension, the number of which is growing. “Some countries seek to use military force bypassing the United Nations Organization,” he said. “We stand for the supreme role of the United Nations Security Council.” He once again reiterated Russia’s position on Syria and Iran. “All participants in the meeting praised Russia’s success in the political and diplomatic settlement of the crisis. Chemical weapons have been placed under control and soon will be destroyed. 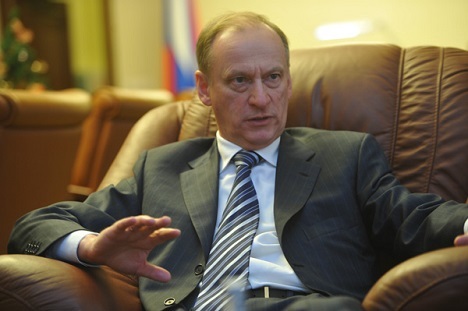 The positions of the BRICS countries on the Syrian problem are either close or similar,” Patrushev noted. On Patrushev’s initiative, an agreement was reached to organize regular expert consultations between deputies of BRICS high representatives who are in charge of security issues. “I think the discussion was fruitful and construction. It proved that such five-party meetings are very useful,” he added. The secretary of the Russian Security Council invited his colleagues from the BRICS countries to attend the fifth international conference of security due to be held in Russia’s Kazan in June 2014. This conference is expected to be attended by high representatives from more than 60 countries. Patrushev also hled bilateral meetings with heads of all BRICS delegations.